Marine engine diagnostics is the analysis of the engine's built in computer system (sometimes referred to as the engine control module - ECM, central processing unit - CPU, engine management module - EMM or the engine control unit - ECU). This is done by plugging a special processor into the ECU of the engine that connects to a small computer. 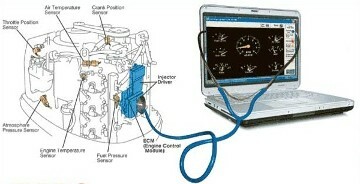 The processeor communicates with the onboard ECU and tells the technician valuable information about the engine which includes: The engine's model number, the engine's serial number, actual engine hours, the engine's RPM history profile, the engine's running temperature profile, current and stored fault codes, and a data parameter summary. Engine diagnostics is essential to know and understand the engine's history, current issues, verify hours, and helps to understand the true overall condition of the engine. Computerized marine engine diagnostics saves hours of labor time (and money) on trouble shooting the engine and lets the technician know exactly what the problems are. As a Yamaha certified outboard engine technician and a Mercury / MerCrusier certified technician I can analyize the engine's data parameters and see problems or potential problems that engine sensors (that rely on resistance and volt references) can not detect.